The acquisition by EIG may hold some advantages for Sitebuilder, as EIG also own a plethora of other website related brands, tools and products. Partnering with such a big organization, spanning 4 continents and over 80 brands, should, in theory provide ample scope to integrate useful tools and services to enhance the product. While Sitebuilder only launched in 2014, the sleek and slick site, fool proof design tools and editor provide a really simple to follow platform to build a professional looking site. SiteBuilder provide a free domain name for any of their premium packages, and a free e-mail address for the top 3 premium packages. The domain is free for your initial term only, so if you sign up for a three year subscription, your domain is free for 3 years, if you sign up for annual subscription, then the domain is free for one year respectively. SiteBuilder publish the rate for domain renewals here on their site. If you want additional domain names these will also be available at a price. The free e-mail address has no renewal cost, it is just simply free on any of the applicable packages. You can set the e-mail address up to represent your own site and brand, handy for streamlining communication. SiteBuilder have a number of SEO tools to help you measure and manage your on-page optimisation and boost your sites potential in the rankings. With the Premium or eCommerce plans you get an SEO Tools package, but there are additional addons and widgets that you can purchase to bolster these tools, called the ‘Ultimate SEO Package’, and ‘Social Booster’. These tools, including the SEO Tools standard pack that comes with the two top premium packages, are really easy to use particularly for beginners with little to no knowledge on how to help your site naturally rank. They make measurement and application easy enough for anyone. The SEO Tools provided by SiteBuilder allow you to do all the basics of adding and editing site tags, meta descriptions, add and use keywords and measure visibility and traffic. There is also a fully-fledged SEO eBook which, with the level of detail is great for beginners to pick up the basics and learn the skills needed to boost your site. Tied in closely to this, is a great little social media widget that can be embedded neatly onto your website to help encourage engagement while at the same time not looking out of place or obstructive on your site. With the eCommerce Plan, you get the ability to create an eCommerce store. There are several eCommerce packages that you can add to your plan, Basic; Unlimited; Essential and Professional. The tools and services that you get for eCommerce depend on which plan you take but each of them allow you to create a store, manage product placement and store pages, stock and payments and manage customer communication. Payment processors are a little limited but one really important factor is that SiteBuilder are fully PCI compliant, and that is very important. SiteBuilder is great for building blogs. It’s so easy it’s unreal. The post manager is incredibly versatile and intuitive, making it quick and simple to get your posts up, tag feature posts, edit drafts, pin posts and categorize. It’s a good blogging platform, heavily focussed on simplicity and ease of use. 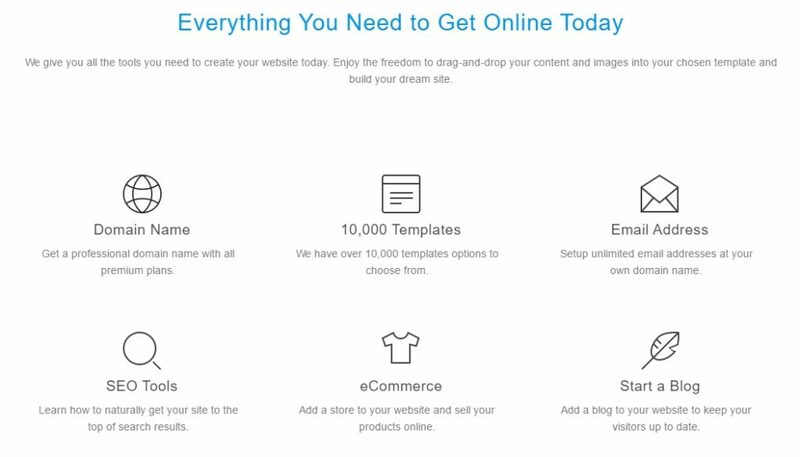 SiteBuilder offer 5 plans in total, each with their own level of functionality and resources. The plans at the lower end of the ladder are more suited to personal websites, clubs or informational sites, whereas those toward the top end are more suited toward sites that aim to generate a wider audience or income. If you wish to use your own domain, and have that branded as your own rather than a subdomain of SiteBuilder, then you want to be looking at a paid plan. The higher premium plans also include features such as marketing and e-mail campaign assistance, mobile-compatible sites and priority support. It’s important to know that the promotional pricing above is for the first term only, and that following the expiration of the initial term, the pricing reverts back to the normal price for that period. We have published the normal pricing against each of the plans below so you can easily see the renewal rate once your promotional period expires. Here’s the breakdown of each, what they include and the price. As with most of the website builder platforms such as Weebly and Wix, the free plan will include ads for SiteBuilder, and also be hosted as a sub domain of SiteBuilder. As such, the free plan is not really suited for a professional business of any size as it cannot represent your own brand effectively. This is common in the website building platform arena. As far as free accounts go though, SiteBuilder’s free plan is one of the simplest to get a handle on. 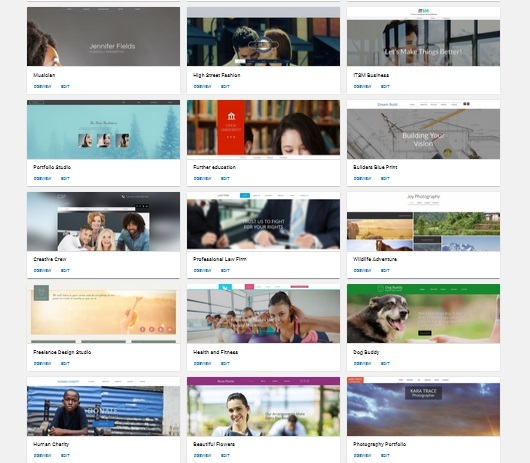 The drag and drop website builder and editor is unbelievably easy to use, and you have access to thousands of customizable templates. Much more than any other platform. We go into the details of the editor further down the post. The free plan is great for groups or clubs where branding doesn’t matter, and you don’t need to work to build an audience. The personal plan is the most basic of the SiteBuilder premium plans. With this plan, all SiteBuilder ads are removed and you can use your own domain. Apart from that, you get the same features as the free plan, but no tools for eCommerce or SEO. This level of plan, again, is good for clubs or groups or also for small blogs where your own brand matter, but there is no real need to grow a large audience or scale. This is suitable for personal sites rather than businesses. 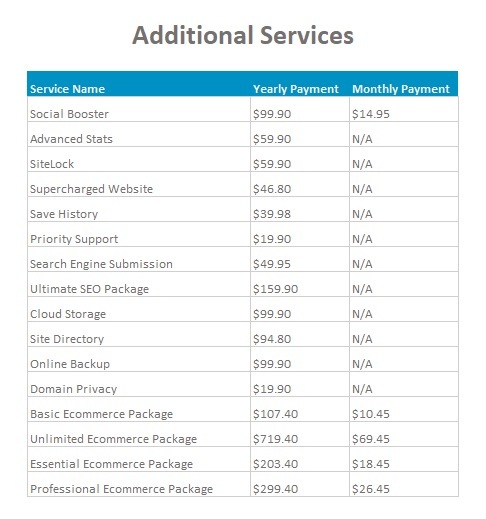 In terms of pricing, it doesn’t appear that SiteBuilder offer a promotional rate on this particular plan. The introductory rate is equal to the normal rates in the image above, where for each of the annual, biennial or triennial subscription plans the rate is $8.99 per month. 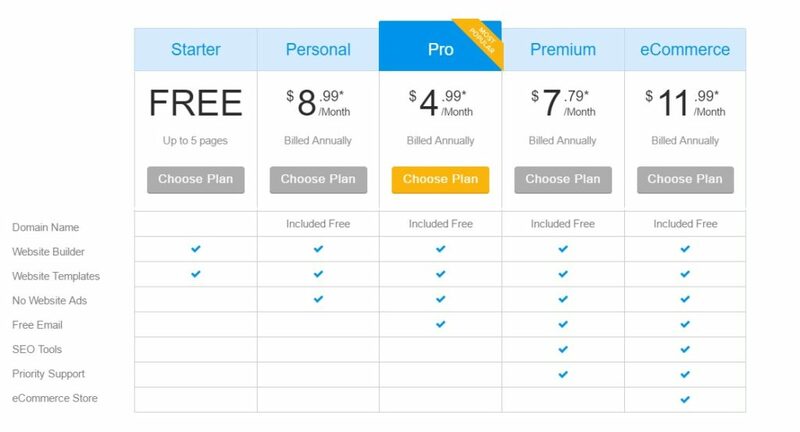 A monthly subscription will cost you $9.99 per month. The Pro Plan is the next step up in terms of the premium plans, and with this one you get everything that is in the Personal Plan, with the inclusion of a free e-mail address. This is handy if you want to start a mailing list or newsletter for your blog. There are additional features that you can plug in at a premium to any of the plans that we look into below. As it stands though, this plan can work out cheaper than the Personal Plan, with the added benefit of an e-mail address depending on the length of subscription you take. I would suggest that this type of plan is suitable for the same type of site as you would build with the personal plan, but where you would greatly benefit from having branded e-mail. This plan does come with a promotional rate for the first term. That rate is $4.99 per month based on an annual subscription. For a biennial and triennial subscription, SiteBuilder also offer 35% discount from the normal monthly rate published above ($7.68). Remember that the shorter the subscription you take, the quicker your promotional rate will run out and revert to normal pricing. If you can afford the bulk payment at the start, a longer subscription period will always be cheaper in the long term. The Premium Plan, is the minimum level you want to be at if you are looking to build a professional site or blog, where you wish to build an audience and a significant presence online. You get all the features of the Pro Plan, but with the inclusion of SEO Tools and Priority Support. The SEO Tools help you optimize and measure your online presence, and the Priority Support ensures that any support tickets you raise are placed at the top of the list. The latter can be incredibly invaluable if anything ever goes wrong. There is nothing worse than getting caught with your pants down in front of a live audience, and that’s how it can appear if a site goes down, or a bit of script or code causes an issue. The Premium Plan is offered at a promotional rate of $7.79 per month based on an annual subscription, which is a 35% discount on the normal monthly rate of $12.29 based on a subscription of the same length. SiteBuilder also offer this 35% discount for biennial and triennial subscription terms. The normal rates that come into effect after the promotional term are published above. If you ware wanting to add any level of eCommerce to your site, whether as a side focus of the site, or as a store where eCommerce is the core purpose of the site, then this is the plan that you need. You get all the features of the Premium Plan, with the addition of an eCommerce store. There are different levels of functionality you can add to this eCommerce environment in a series of four eCommerce addon plans. The eCommerce features allow you to control product placement, payments, inventory and availability as well as all features you would expect in running an online shopping experience. It is not as sophisticated as the eCommerce environment provided by, say, Shopify, but it is great for the price, and everything you need for a either a casual shop, or professional small business. In terms of price, SiteBuilder offer the eCommerce plan at a promotional rate of $11.99 per month for your first term, based on an annual subscription. Promotional rates are also offered with a 35% discount on normal price (published above) for biennial and triennial subscription terms. The promotion is for the first term only, so if you take a three year subscription, the promotion is for three years, if you take annual then it’s just for a year. After the promotional term, pricing reverts to normal rate but this is normal regardless of who you go with. It can actually be a bit harder to get the normal rates from some of the other web builder platforms without sieving through the finer detail. The rates are quite transparent on SiteBuilder. Now, here is SiteBuilder’s piece de resistance. The templates on offer here are not only professional looking, sleek and functional, but they are also here in abundance. There are over 10,000 templates to choose from and that is an incredible offering unmatched by any other provider. These templates are categorized into different styles and layouts. If by chance though you can’t find a design to suit your needs (hard to imagine with the sheer volume) then SiteBuilder also offer the option to order up a custom-built template. This is quite a unique feature amongst SiteBuilder and its peers. While some templates lean toward specific industries naturally, each and every one can be tailored and configured to suit any need. You might see a template that shows off fitness as an example, but that doesn’t mean it is limited to that niche. The cosmetics are insignificant in this regard, they each can be tailored to whatever you need, and there are also blank templates if required. Ok, so the two major elements that make SiteBuilder so simple and easy to use, are the design editor, and the Control Panel. We will look at the ins and outs of each of these. With exception to the sheer volume of excellent templates, the editor is probably the best thing about SiteBuilder. The layout is stripped of all pretentiousness or expectation of prior knowledge and incredibly easy to follow. As far as website builders go, the ease of use, drag and drop functionality and simple navigation are miles ahead in this editor. SiteBuilder have such an easy editor to master, it really does make getting a site up and running a quick and easy task. The editor keeps things simple, in both structure and function. The nav bar on the left of the screen is split into easily digestible subsections that help you manage each element of your site. You can pre-set some elements such as buttons, so that they are assigned as a ‘master’ and therefore appear in the same place on every page. Handy if you have a button you wish to appear for say a sign up or a ‘contact us’ button. Adding single images, galleries and even perusing stock images to use is as simple as point, click, drag and drop by following the navigation. From this Add Panel, you can quickly drag and drop all design elements for your site, from shapes, images or videos, social widgets, additional menus, documents and much more. Everything you could need for a professional looking site. The beauty of it is, that it takes no time at all to add all the elements you want and it directs you through the process. This is great for those with little or no knowledge in building a website. The Design Menu allows you to alter the characteristics of the written fonts and the style of text and background you want on each page. There are some preset color pallets that are set up to provide a range of complementary colors, making it easy to nail out the aesthetics and mood for your site. 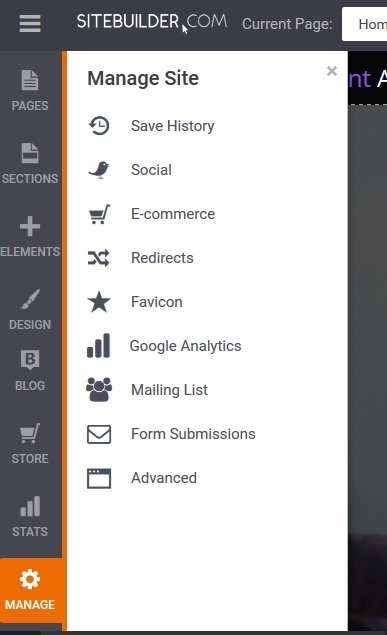 The Manage Menu, allows you to manage all the eCommerce, social and SEO elements of your site, to manage the site’s online identity with favicons and HTML inputs for the header and footer. The Preview menu item also allows you to monitor your changes and progress as you go. Once you have changed some elements you can click to preview and this will show you what the site will look like when searched for and visited across the web. The Control Panel is equally as simple, intuitive and functional. When you log in and enter your panel, there are some simple options in the navigation that allow you to select from your hosted sites (if you have more than one) and to get started in amending your pages it is as simple as clicking the edit option from the menu. Any add-ons you purchase, or marketing tools and back end domain features are all available from the navigation panel. The items that are relevant to you in your control panel, will depend on which plan you have signed up to with SiteBuilder. For example, clicking on the SEO Tools will only take you to the relevant page if you have that included in your plan, otherwise you will be directed to a page where you can upgrade to unlock those features. One thing that is missing from SiteBuilder, is a phone contact team for technical support. This is a strange decision. They do have a phone support team for billing but not for technical support. This seems to have been an issue with some customers who really need a live support service rather than relying on e-mail. It does look like SiteBuilder are listening though, as they have implemented a live chat service for both billing and technical support and the response time, in my experience was fast. Within a minute of contacting support via live chat I had an agent on the other end. Within 5 minutes my simple questions were resolved. I contacted them as I wanted to test the response time first hand. To start with I began with simply asking what you get with priority support. The answer to that, was that basically you get any support tickets raised to the top of the list, taking precedence over customers that don’t pay for that service. Straightforward enough. I then went on to ask a couple of other questions about transferring domains, downtime and latency to test the knowledge a little bit and was satisfied with the answers received. Along with the live chat, there is also an extensive knowledge base, which includes several video tutorials and design help. A backup feature is also available as a fairly inexpensive addon to ensure that previous versions of your site are available if and when required. There are lots of additional features and add-ons available through SiteBuilder, but there isn’t an extensive app store, or third party apps that you can plug in like with some of the website builders. Rather, there is a set of in-house add-ons, as listed and priced above. Some of these are fairly standard and often appear as core elements of packages with other competitors. However, here you can pick and choose what you need and what you don’t, and perhaps that is why SiteBuilder can offer the core packages as cheap as they do. If you want to know the ins and outs of these add-ons, I suggest contacting their live chat. This not only gives you an opportunity to see how quickly their customer service response is, but also to test their knowledge in their own products. As customer service is key, it’s never a bad idea to test a company’s service out for yourself before committing to a plan. SiteBuilder do offer a 14 day money back guarantee, and they accept many modes of payment including PayPal, Visa, Mastercard and AE. Subscription terms range from monthly, to annuall biennial or triennially. Promotional rates, as discussed above are often offered but do change from time to time. You can cancel your account at any time via e-mail, but there is an early termination fee to be aware of depending on the length of your subscription. This can be easily avoided in most cases if you simply take the free account, build up your site design as you want it before committing to a paid plan. If you discover it’s not for you, then it’s cost you nothing rather than having to fork out to leave if you paid before you tested. If you are a beginner, have no web building knowledge at all but have a great idea for a site or small casual business that you want to test and get off the ground, then SiteBuilder could be good for you. Its simplicity take all the hard work out of building a site for you and it is incredibly easy to follow. This simplicity does however, make it a bit limited for those that are looking for some advanced features or functionality. If you are wanting any level of complexity to your store, such as global shipping, setting local tax rules or multilingual functionality then this is not for you. If you simply want a place to share ideas and sell some items with a simple but good looking environment, then this could definitely be for you. There are services out there that have much more features available, but its important to make sure you find the right one for you in terms of price and function. Another thing to be aware of is that if you decide later down the line that you want to take your site and host it somewhere else, SiteBuilders current terms of service do not allow any transfers. A bit strange that one, but if you do later decide to move on, you might find yourself having to rebuild your site on the platform you decide to move to. Not so much of a problem for a small, casual blog or store, but a much bigger issue if you have a big eCommerce site. Overall, I would say that SiteBuilder, have a good suite for what they offer, a fantastic range of templates and an awesome, simple editor. If you want a nice easy blog, or a small shop, its worth at least checking out the free account and trying it for yourself. If however, you want a level of complexity to your online site, features that are perhaps a bit advanced and not really standard then make sure you understand what’s on offer and what is not, what comes at a price and what is free. SiteBuilder are still relatively young, and it will be interesting to see how their services develop as the company mature.